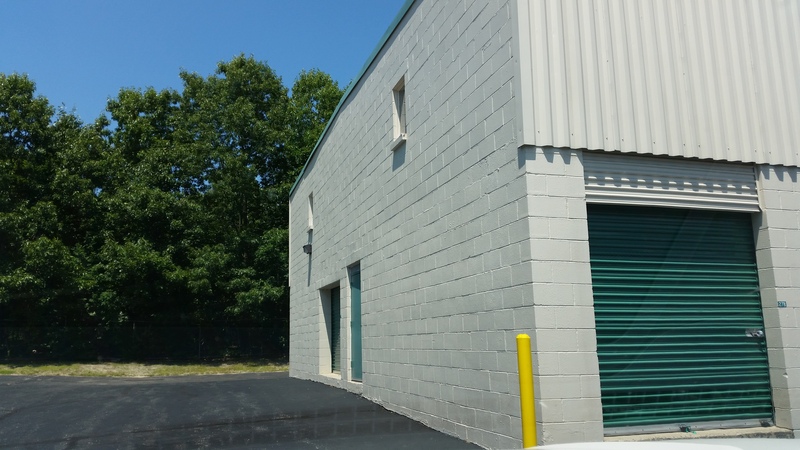 Last week Alex and I traveled to New Jersey to visit our storage unit and clear out the last of our stuff. People sometimes ask why we got the storage unit in the first place, and all I can say is: it made sense at the time. We were moving to London and we didn’t know how long we would be here. If we hated it (or our visas weren’t renewed) and we moved back to the US after a year or two, it didn’t make sense to either A) ship all our stuff over and then back again, or B) buy entirely new stuff. Plus, we didn’t really have the money for either of those options! The little door around the corner leads up to the smaller units. So that’s why we decided to get a storage unit in the first place. But why did we decide to get one in Howell, NJ, when we lived in Brooklyn? Again, it was all about the money. A storage unit in Brooklyn or Queens, or even out on Long Island, would have been 3 or 4 times more expensive, and we really needed to count our pennies. And since we figured we wouldn’t need to access it very often, it was okay. We chose the place in Howell, NJ largely because it was cheap, but also because it was on a bus route from Manhattan. So if we visited NYC and we didn’t rent a car, we could (theoretically) take a bus down there. It seemed logical at the time, but we failed to consider what we would be DOING with the stuff when we visited: each time we’ve gone through a few boxes to sort/donate/bring stuff back in empty suitcases – which would have been nigh-on-impossible on a bus. So we’ve rented a car (and paid gas and tolls) each time. If you add the price of the car rentals and gas/tolls to our overall storage unit bill, it would skyrocket over that $3,000 mark. When we first went down to sign-up for the storage unit, we discovered that the second-floor units were significantly cheaper than the first-floor units. And despite being warned that it was up 14 steps, we again made the decision based on frugality. A decision we would come to regret as we have schlepped (really heavy!) 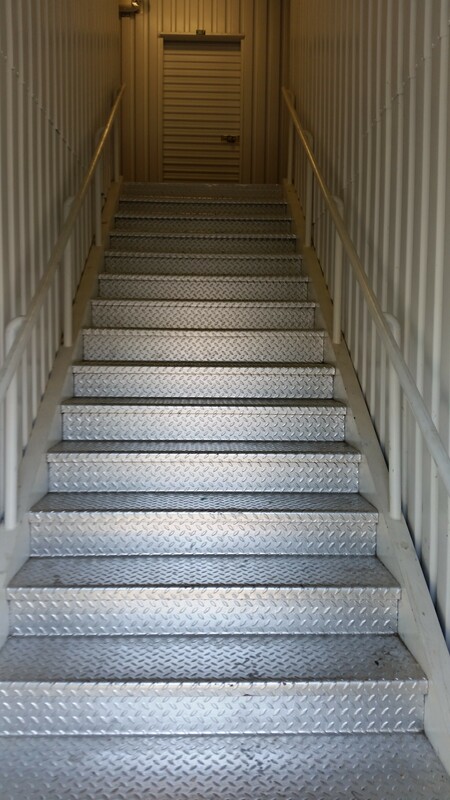 stuff up and down those stairs over the past five years. Times a zillion! And do that in the heat and cold, with no facilities, and you’re guaranteed a few cranky exchanges. The sorting process. Into piles, of course. Once we got our permanent UK residency cards last fall, we decided that enough was enough. So we made two trips (one disastrous attempt in January, during a blizzard when it was freezing cold) and one just last week (when it was ridiculously, boiling hot) to clear the thing out. In our shared calendar, the trip was called “STORAGE UNIT OR DIE! !” I’m pleased to say we didn’t die. 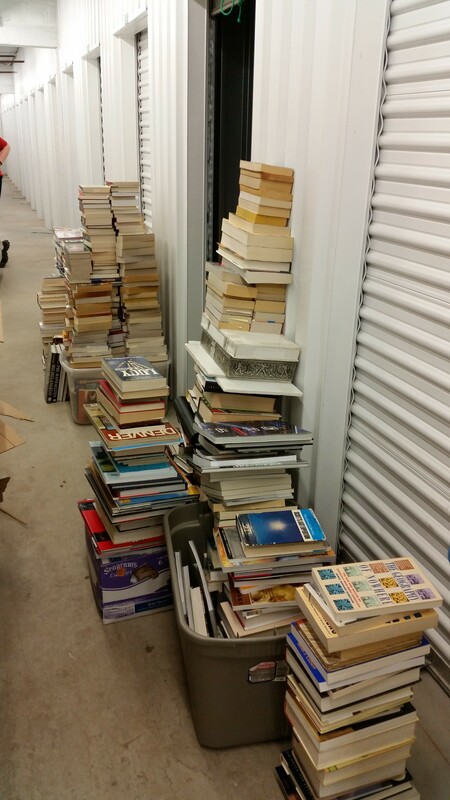 For the record, we had at least 14 boxes of books in the unit to deal with. We estimate it was about 1,000 pounds (weight, not value!). 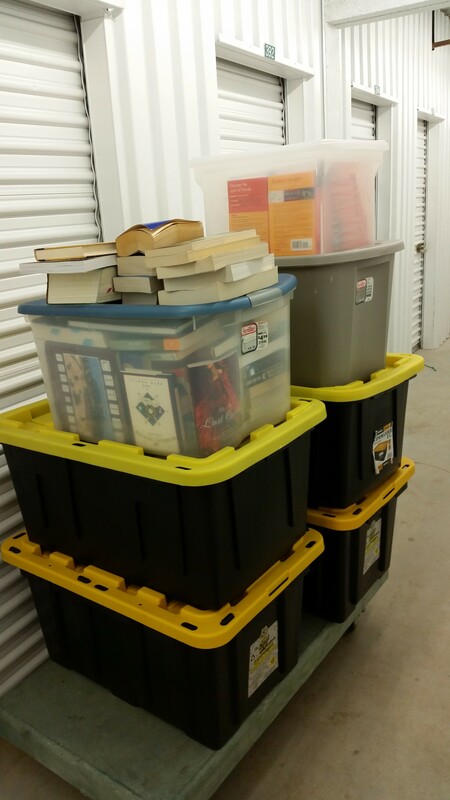 Of that, we ended up taking 10 boxes to a book re-seller in Pennsylvania… he paid us about$130 for all of them. There were a lot of painful decisions to be made, but ultimately we only brought back the books that were valuable financially or sentimentally. Anything that could be replaced or repurchased was sold or donated. In addition to the books, we have all the china, flatware, and wine glasses that we received as wedding gifts. I’m really pleased to say that managed to find a way to bring it all to London in our carry-on baggage. I’m sure it looked funny going through the x-ray, but no one questioned it, so I guess they are used to seeing Champagne glasses in bubble-wrap! Of the other things remaining, the only problematic item was my wedding dress, which I wasn’t expecting. No one wants old wedding dresses. Or rather, they want properly old wedding dresses, but 8 years isn’t old enough to be considered “vintage”, but it’s not young enough to be in style. None of the charities would take my dress – not even Brides Against Breast Cancer! 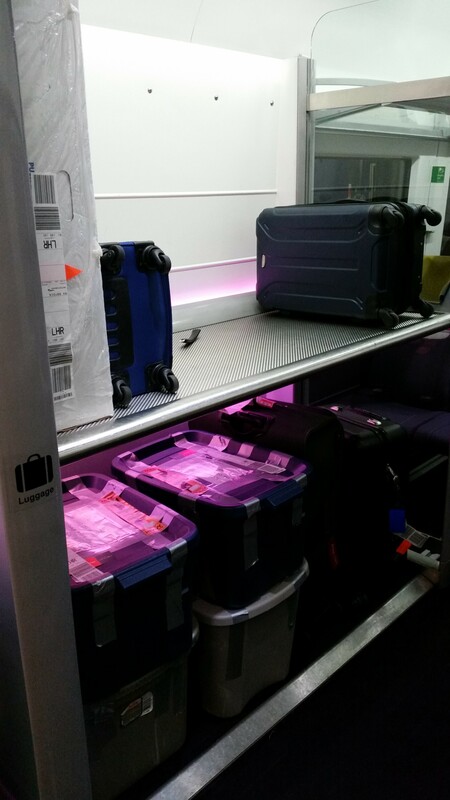 So we risked putting the giant box in the cargo hold, and brought it with us to London. I’m not entirely sure what I’ll do with it here, but I’m sure I can eventually find someone who wants a lovely dress. So that’s that! The last of the ties that bind us to the US (other than friends and family of course, and student loans…and taxes…). It feels so good to get rid of the storage unit. It’s like a giant, 5×5-foot monkey off my back. It started off a haven where we stored the things that were precious to us, but over the years it became an albatross. Making the (increasing!) payments every month and every year, visiting it when possible to ensure that nothing was wrong, sorting through our previously-treasured possessions which – after five years apart – felt more like the detritus of a life abandoned … well, trust me. Don’t ever get a storage unit. All the stuff being donated! Mostly books. In boxes that are too big to move when they are full of books. The only way we were able to bring as much stuff back as we did is that Alex has status with British Airways, which means he gets more bags, and heavier bags, than usual. We could bring 8 pieces of checked luggage, and each could weight up to 70lbs. We didn’t quite use up our entire allotment, since the wedding dress box was large but light, but I feel really bad about those tubs of books. We sealed them up with duct tape, but I still had visions of the boxes opening up and all our books being loose on the runway! Luckily they made it safe and sound. We brought stuff back with us in tubs, as well. This is us, almost completely filling the luggage rack on the Heathrow Express. All these bags are ours! Don’t get a storage unit! Number/label all the boxes and match it to the inventory. Take pictures of everything that goes in each box. That way you can sort remotely and make the hard decisions in advance, rather than dealing with an emotional sucker-punch every time you open a box. Don’t get cardboard boxes. Get plastic tubs instead. With handles. Get plastic tubs that are small enough to shift easily. Go for the ground floor unit. Your back will thank you. Be seriously, sadistically ruthless when deciding what to keep in the unit. If you can buy a new one, do so. It’s not worth the price of saving that toaster. Trust me! Consider hotel availability near the unit – where are you going to stay when you visit? The nearest hotels to Howell are a 30 minute drive away, which means we lost an hour each day just to commuting. Negotiate a lower price and longer terms when you first move in. They will increase it every year, but if you start at a lower base, you’ll pay less overall than if you just take the first offer.